Just what in the world is a spinning wheel? Is it a wheel that spins? Or is it something that actually works? In my opinion a spinning wheel is an old piece of equipment that actually spins fiber into yarns. I have new wheels and antique wheels. I have plain jane wheels and those that have really fancy turnings on them. I have heard the arguments that if a wheel doesn’t have some really fancy wood turnings on it really isn’t a spinning wheel. Do you really think the turnings on the legs, the wheel posts and the mother-of-all have anything to do with the way a wheel works, it’s efficiency? No, that is all for the professional home decorator. 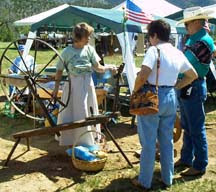 The maker of a wheel might take a lot of pride in the looks of the spinning wheel and other fiber equipment, but it has nothing at all to do with how smoothly the wheel turns, how easy it is to spin fibers into yarns or what pleasure one gets from using the wheel. One of my spinning wheels has a wheel made from plywood. The rest of the wheel is made up from sanded, stained and varnished one by fours and two by fours. I think this is a beautifully simple little wheel. It was my first and came in kit form. On another of the wheels I have collected, no two pieces of it are identically turned. Does this affect the way this particular cobbled together wheel spins fiber? Absolutely not! I do not have one of the Babe wheels, which are polyvinylchloride piping and a bicycle wheel, but it would spin fiber just as well as one of the really fancy turned wooden products. Beauty is in the eye of the beholder, especially when it comes to our useful “house decorations”. Yes, I love wood products, polished to a high shine with beeswax! None of my furnishings have the same woods, stains, or finishes on them. The thing I prize most in each of the seven spinning wheels in my house are that they work! Two of them are around one hundred fifty years old, two of them are only about ten years old, the rest are somewhere in the middle. They are oak, maple, walnut, beech, and pine! They all have attitude! I don’t prize any maker of any wheel over any other. Each type of wheel has it’s use and it’s individual idiosyncrasies. One wheel will work better for coarser wools, one will work better for things like the new silks. One will work great when the air is really dry and hot and another requires a rainstorm to work well. We all just need to be mindful of the use we put these little machines to. If they are purely for decorative purposes, they need the fancy turnings and high polish. But if they are for use as a yarn making piece of equipment, then they need only work well and not be really fancy at all, just plywood and a few boards will work just fine.